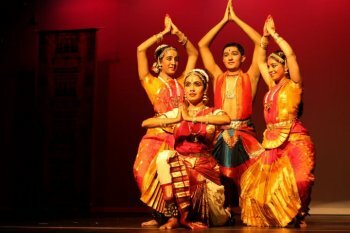 The St. Louis Indian Dance Festival tries to provide a platform to mostly US based Indian classical dancers. This 4th edition of the festival lasted for three days (April 20 – 22, 2012), presented many talented dancers, experienced dance gurus, organizers on one stage. It also had a seminar on ‘Future of Indian classical dances’ which poured conviction on an Indian learning over an American learning of Indian classical dances. The lively discussions brightened the differences and brought out plausible suggestions from teachers, parents, audience and organizers. The festival had a sense of multitude in terms of presentation, theme and talent. The evening events of the festival were attended by more than 1200 people. It presented more than 25 different dance performances covering main styles such as Bharatanatyam, Kathak, Odissi and Kuchipudi. 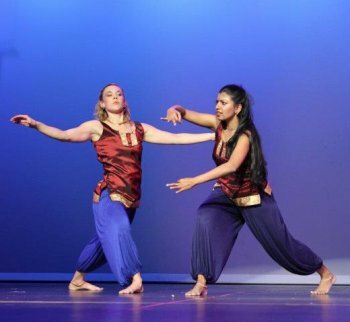 It presented fusion dance performances such as Bharatanatyam – Mohiniattam, Bharatanatyam – Jazz, Bharatanatyam with English poems. While known dancers like Prashanth Shah, Nirmala Madhava, Ramya Ramnarayan and Srilatha Suri presented traditional items, others like Guru Prasanna Kasthuri, Savitha Sastry and Sushma Mohan showcased productions on newer themes. Talented dancers such as Shipra Avantica Mehrora, Anwesha Das, and Rachana Madhav Rao recreated new choreographies through their traditional dance base. The inaugural dance performance was by the host Soorya Dance Company where the students presented Shloka Trayee, a dance item in praise of Ganesha, Saraswathi and Guru. It also had a fragrance of Kathak through very popular “Omkara Swaroopa”. Bharatanatyam dancer Rachana Madhav Rao used Bombay Jayashri’s popular “Maha Ganapathim” to do the Ashta Dikpaala Vandana and to praise Ganapathi. She used the story of Ramayana and capably depicted navarasa, the nine prominent emotions of dance, which was followed by a traditional varnam in raga Behag. Shipra Avantica Mehrotra, a rising star in Odissi, mesmerized the audience with her graceful Odissi movements and her exquisite depiction of Sita’s abduction by Ravana. Delicately showing the drops of rain in “Barsaa Vishaara” choreographed by Guru Aruna Mohanty, she flawlessly moved from one pose to the other like a statue come to life. Anwesha Das, a young dancer from Seattle, is the senior-most disciple of Urmila Sathyanarayanan. Originally from Orissa, Anwesha grew up in Chennai and proved her dedication to the art form and technical finesse right from the start in Pushpanjali. She went on to beautifully portray the subtleness of a mother and the pranks of little Rama in Tulsidas’s “Tumaka Chalatha Ram Chandra” and ended her performance with a Kaanada tillana. The next artist on the roster was Prashant Shah, an outstanding male dancer in the Kathak dance style. Trained by Guru Kumudini Lakhia, Prashanth showcased his mastery over technique and abhinaya with his perfect pirouettes, impeccable footwork and graceful hand gestures in ‘taal Dhamaar’ (14 beat rhythmic cycle), ‘Piya Bawri’ and ‘teen taal.’ An experiment of two dance styles was unique to St. Louis audience. The evening ended with a Bharatanatyam and Mohiniattam performance by Anu Samrat and Vinod Menon. Anu Samrat’s navarasa abhinaya attracted many whereas the nayaka bhava from Vinod looked appropriate on him. The second day began with the Samanvita Kasthuri singing an invocation to Lord Ganesha. Odissi dancer Enakshi Sinha, a student of Sharmila Biswas from India now settled in Canada took the center stage. She began the recital with ‘Ardhanarishwara,’ one of the finest and richest choreographies of Guru Kelucharan Mohapatra. This piece draws its literary base from the composition of Adi Shankaracharya and describes the iconography of the image of fusion of Shiva and Parvati. Well trained and technically sound, Enakshi’s bright portrayal of Shiva and Shakti brought to fore the beauty and grace of the dance form. The next group on stage was the popular Three Aksha Dance Company from Philadelphia that has performed all over US, Canada, the UK, Europe and India to rave reviews. Viji Rao and her team presented popular dance numbers like Ikshudandadahara, Sriman Narayana, Sankeernam Allaripu and Bhagyada Lakshmi Baramma and excerpts from her production ‘Uurja’ that is already creating waves. Perfect synchronization, fresh choreography and flawless presentation made the performance a class apart. 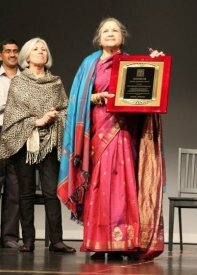 Sushma Mohan, one of the first disciples of Guru Prasanna Kasthuri originally from India and at present in Los Angeles, presented her popular production ‘Srichakra’ along with her students. Using traditional Bharatanatyam technique in a refreshing approach, the angles and shapes that form the holy geometrical figure were presented in spellbinding formations by the dancers, who used interesting props and innovative movements to make the abstract concept of holy shapes more conceivable to the audience. Srilatha Suri, a disciple of Dr. Shobha Naidu, presented the popular dance drama of Kuchipudi ‘Sri Krishna Parijatham.’ Taking the audience on a roller coaster of emotions between laughter and divinity, Srilatha unveiled the attitudes of Satyabhama superbly along with a supporting group of dancers. Nirmala Madhava and dancers of PAMPA Dance Academy, San Jose, added to the feast of festivities with their Kathak and Bharatanatyam group presentations. With bright costumes and neat presentation, the dancers performed to “Ganapathy Moorath”, a composition of King Ibrahim Lodi of Bijapur kingdom, which was choreographed by Guru Maya Rao. Nirmala next performed to “Omkaara kaarini” depicting the mother goddess in all her hues and then alleviating the ambience with the popular “Hanumantha Devo Namo”. Ramya Ramnarayan, well known dancer from New Jersey, took the stage next presenting some traditional Bharatanatyam dance numbers along with her students. Her years of training under gurus Rajarathanam Pillai and Kalanidhi Narayan were evident in her exemplary abhinaya in the javali. On day three, senior dance guru of the Vazhuvoor tradition, Kamala Lakshminarayanan was honored with the Lifetime Achievement Award. Popularly known as Baby Kamala and Kamala Lakshman, she was also an actress and appeared in almost 100 Tamil, Hindi, Telugu and Kannada films throughout her career. In the St. Louis Indian Dance Festival, she was honored for her teachings in USA. She was recognized for her service to enrich the cultural phenomenon of USA through Indian dances. Well known legendary sitarist, Ustad Imrat Khan, son of the legendary Ustad Enayat Khan and younger brother of the equally legendary Ustad Vilayat Khan, the senior-most member of the famous Etawa Gharana (musical dynasty), honored Kamala. The felicitation event showcased a video highlighting the major achievements of Kamala. The Bharatanatyam performance by Shreya Desikan, a disciple of Guru Kamala Lakshman, showcased the essence of Kamala’s style of dancing. Shreya’s dance style reflected the elegance of Kamala’s teaching. Prasanna Kasthuri along with his Soorya Dance Company presented ‘Tagore- Shakespeare-Angelou’ based on the negative-positive human behaviors. Rabindranath Tagore’s “Where the mind is without fear” highlighted the message of the poet for freedom through Bharatanatyam and Kathak. The positive nature of human life reflected through the romantic poem of William Shakespeare, “My mistress’s eyes are nothing like the sun” featured husband and wife - Prasanna and Seema. The outstanding music and the stage setting made the dance enjoyable. Maya Angelou’s powerful message was inevitable in the dramatic presentation of “The Caged Bird” bringing to life the struggles of African Americans in 20th century America. Rendering of “Episode of Rosa Park’s Bus incident” glared directly over the audience as a historical evidence of the civil rights movement of United States of America. The dancers Shalini, Annuja, Shwetha, Samanvita, Chinmayi, Keertana, Shubhi provided good support to Guru Prasanna Kasthuri, who excelled in abhinaya and sanchaari (story-telling). This presentation showcased the adaptability of classical dances of India in presenting universal themes. Savitha Sastry presented her solo Bharatanatyam experience - excerpts from Music Within, an attempt to utilize the spectrum of human feelings. She portrayed the dismal situation of a deaf girl trying to learn dancing. Her abhinaya was superb, and her nritta was flawless. Two young dancers Radhika Prabhu and Vidya Venkataram followed next in their individual solo performances. While Radhika Prabhu chose to present contemporary Kannada poetry in Bharatanatyam, Vidya chose to present conventional dance numbers - javali and navarasa Ramayana. Both proved to be very promising, dedicated and hard-working, and are sure to go places, if more platforms are provided to showcase their talent. The Nritya Dance Company headed by Guru Hema Sharma from Kansas City presented Bharatanatyam, whereas Anita Babu from New Delhi presented elegant Odissi dance through traditional pieces from Orissa. Guru Gangadhar Pradhan’s training was showcased elegantly through Anita’s dance presentation. Highly talented, graceful Prathiba Natesan presented a unique piece ‘Ganga & Mississippi’ – a representation of environmental disasters happening to the world rivers by taking two rivers, Ganga from India through Bharatanatyam technique and Mississippi using the Western dance techniques by Lily Sloan. This performance was a great finale for the entire dance festival and brought the curtain down on the three day festivities. The ‘Youth Dance Series’ presented young Bharatanatyam dancer Bharatha Ram from San Antonio, Kuchipudi dancers Pranathi and Pranamya from Dallas, Shyama Iyer from Louisville and Deepti Yogananada from Indianapolis. The young dancers were talented and have the makings of professional dancers with the right support. Bharatha Ram performed with vigor and precision and impressed the senior gurus. Both Pranathi and Pranamya presented Kuchipudi very impressively. Shyama Iyer’s performance was elegant, and Deepthi presented abhinaya in a mature way. All these youngsters, who were born in USA, are very promising and show sure signs of keeping the classical tradition alive for the future. Both mornings featured seminars of different topics relevant to the field of dance and art. Dancer Smitha Rajan spoke about issues faced by dance teachers while imparting training to American students. NRI children wondered why it was difficult to do an expressive or abhinaya piece. Anwesha Das discussed the influence of language in dance. Guru Enakshi spoke about the challenges she faces while teaching Odissi in Canada. Savita Sastry spoke about connecting a classical art form to modern times. Viji Rao discussed about the participation of teacher, students and parents in a dance system. A couple of audience members questioned the economic stress on parents to get their children trained in dance and music. Their point was an increase in the cost of training. Many also pointed out exorbitant charges demanded by visiting Indian teachers. But this was defended by dance gurus as a payment for professionalism. The artistes drew comparisons between different professions and decried the discrepancies with the audience mentalities. Most artistes agreed that it will be a challenge for classical dancers to survive in the uproar of Bollywood and other multi-media onslaught. Aroon Shivdasani, the president of IAAC, suggested only good quality work will survive the changing weathers of performing arts. Dr. Prathiba Natesan (Denton, TX) discussed the influence of western styles on Indian classical dance. Vidya Venkataram (Bangalore, India) highlighted the use of theater techniques to enrich classical dance presentation. Radhika Prabhu (Bangalore) spoke about the effectiveness of collaborations happening in India, in which she took examples of ballet learning in Bangalore. Radhika quoted her experiences from the well-known ballet presentation ‘Nutcracker,’ which was presented by people trained in Bangalore by a ballet teacher, who had moved from London to India. The most important part of the seminar was the discussion of setting up a central administration body for Indian classical dancers living in USA. The artistes gathered in the seminar agreed upon certifications needed for USA’s Indian dance training. Nirmala Madhava brought out the need for the central body to handle the issues of students in USA. Viji Rao, who was on the panel of many examination centers, suggested having a common syllabus. Kathak dancer Prashanth Shah hinted at the value of such a system for both dance gurus and students. Guru Prasanna Kasthuri insisted on an independent USA based organization to develop the dance pedagogy, run by highly trained USA/Canada based artistes. The seminar participants decided to join in creation of such an entity. The festival witnessed an increase in the number of volunteers that came forward to assist Soorya Performing Arts in organizing an event of this proportion. Dance students and participants were seen on all three days enjoying the dance performances and seminars. Artistes shared their experiences with their co-artistes on and off stage. It was commendable to see artistes from other cities staying back in St. Louis even after their performance to watch other dancers perform. Local organizations such as Abhinaya, Missouri Tamil Sangam, Sangama Kannada Association took an active role in this festival. Local businesses such as Sulekha.com, Enopi Math, USA mortgage supported this venture. The state government of Missouri provided partial finances through its State body – Missouri Arts Council and Regional Arts Commission. Kudos to Guru Prasanna Kasthuri, the artistic director of Soorya Performing Arts, who navigated this huge dance festival with support of his board members – Baskar Subbarao, Prabhakar Betnag, Seema Kasthuri, Nagendra Sanjeeva, Nirmala Renganathan, Willie Bennet and others. Yamun is a Bharatanatyam dancer based in Los Angeles, who went to St. Louis to attend the Soorya Dance festival.